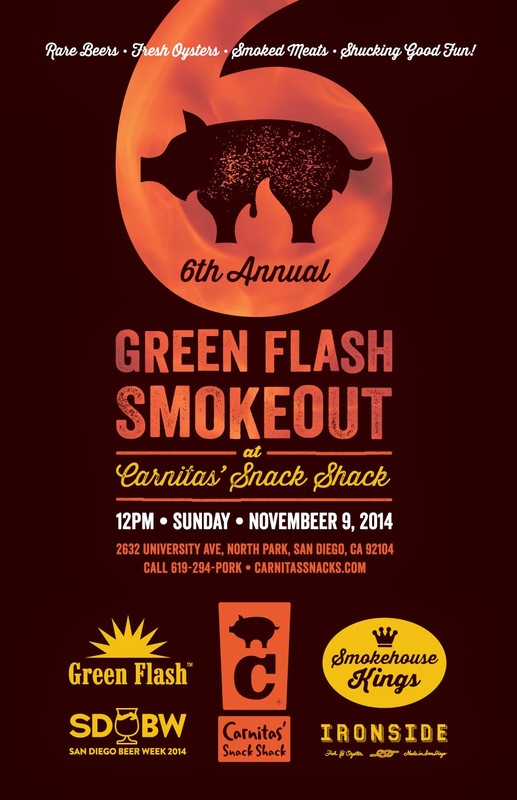 Get ready for the ultimate San Diego Beer Week Sunday BBQ when San Diego's legendary pork haven, Carnitas’ Snack Shack, hosts the 6th annual Green Flash Smokeout on Sunday, November 9, from noon to 4pm at its North Park location. This free-to-attend event gives patrons the chance to enjoy rare Green Flash Brewing Company craft beers, fresh Ironside Fish & Oyster oysters, delicious offerings from Carnitas' roving BBQ company, Smokehouse Kings Smoked Meats, and all in all good fun as NFL football streams on the large screen. Held annually in celebration of SDBW, the Green Flash Smokeout will bring Brewmaster Chuck Silva and Certified Cicerone Dave Adams out for a meet and greet where they will offer attendees a curated selection of special beers to paired with Ironside Select oysters shucked by Michelin-starred executive chef Jason McLeod from Ironside Fish & Oyster Bar and giant legs of smoked meats and other offerings from the Smokehouse Kings carving station. Carnitas' daily menu will also be available for purchase during the event and Green Flash will debut its 12th Anniversary Ale, officially released November 10, but available at this event first! The Green Flash tap list will include Green Flash 12th Anniversary Ale (5.9% ABV Dry-hopped Sour Pale Ale), Green Flash Cedar Plank (6.5% ABV 30th Street Pale Ale, with Spanish cedar), Green Flash Soul Style IPA (6.5% ABV India Pale Ale), and Green Flash Super Freak (10.7% ABV Le Freak, aged in wine barrels with brettanomyces). Chefs Max Bonacci, Ivan Muñoz and Hanis Cavin, aka The Smokehouse Kings, will be preparing Salmon Creek pork leg from Twin Falls, Idaho, Superior Meats leg of lamb from Colorado, and Porterfield Ranch beef tri tip from Dorris, CA. All meats will be hardwood-smoked and slow-roasted and special sides and Green Flash sauces will be on ice to add to your dish, as well as dessert. Carnitas' Snack Shack North Park is located at 2632 University Avenue. This event is free to enter, and people can purchase items à la carte and come and go as they please. For more information, call 619-294-PORK and visit carnitassnackshack.com.